Family Buhač from Ilok in recent years on the wine scene has established itself as a continuously reliable manufacturer whose wines offer probably the best price-quality ratio in the Croatian context. Good location, quality of grapes and unquestionably viticultural and enological art work has resulted in honest wines that discover full potential of Syrmian vineyards. Their Merlot boasts intense red ruby color. It has a characteristic intense scent in the direction of red and black berries (strawberries, raspberries blueberries, cherries) with a hint of black pepper. Aromas of wood are perfectly integrated and only a hint of vanilla coming from the background. 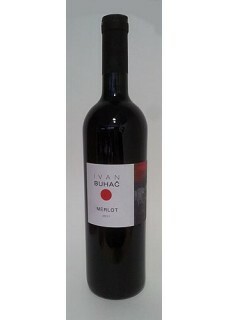 It has medium body with excellent balance of acidity and alcohol. At the end of thea ftertaste, discreet flavor of pomegranate occurs. Food pairing: Steaks, game, roastbeef.